Although probably oversimplified, calculating "earnings per share" or the "earnings-per-share ratio" entails the activity of dividing the net profit of a company by the number of its issued shares. The economic reality is that companies may use innovation and creativity to lawfully engineer a better earnings-per-share ratio in order to attract more shareholder investments. Neither the Companies Act of 1973 nor that of 2008 makes any provision for the maximum or minimum amount of capital required to float a company, or the minimum number of shares that should be issued. This depends solely on the promoters' discretion of the number of shares that must equal the capital amount. It is therefore possible that the promoters may excessively exercise their discretion when deciding on the authorised share capital, and later tailor-make or financially engineer the share capital structure of the business to make it attractive to shareholders or future shareholders. After all, the law does not prohibit statutory financial engineering. The purpose of this article is therefore to consider section 75 in the Companies Act of 1973 - or its equivalent (section 36(2)) in the Companies Act of 2008 - and the topic of statutory approval for an artificial decrease or increase in the number of issued shares. Possible methods of preventing or limiting artificial increases in earnings per share are also suggested. Keywords: earnings per share; earnings-per-share ratio; Companies Act; economic reality; financial engineering; share capital structure. ... the earnings attributable to each equity share, based on the consolidated net income for the period, after tax, and after deducting outside shareholders' interest and preference dividends, divided by the weighted average number of that class of share in issue. The Companies Act of 2008,2 however, provides no definition or suitable explanation of earnings per share. In considering why a listed share has a very high or low price on the Johannesburg Stock Exchange (JSE Ltd), earnings per share constitute the economic basis for interpreting such a price. Although probably oversimplified, calculating "earnings per share" or the "earnings-per-share ratio" entails the activity of dividing the net profit of a company by the number of its issued shares.3 There have been many responses to this core explanation. The economic reality is that companies may use innovation and creativity to lawfully engineer a better earnings-per-share ratio in order to attract more shareholder investments.4 Having thus determined that the relevant share price pertains to the number of issued shares, "earnings per share" encapsulates the economic reality that the number of issued shares may decrease artificially through creative engineering. After all, the law does not prohibit statutory financial engineering. The purpose of this article is to consider section 75 in the South African Companies Act of 1973, or its equivalent (section 36(2)) in the new South African Companies Act of 2008), and the topic of statutory approval for an artificial decrease or increase in the number of issued shares. The economic-reality argument is based on section 85 of the Companies Act of 1973 or its equivalent in Act 2008 (sections 48 refers to section 46(1)c and section 46(1)c refers to section 4 of the Act), which illustrates that section 75 or its equivalent in the Act of 2008 (section 36(2)) is not subject to any liquidity or solvency requirements. In fact, section 75 or its equivalent in the Act of 2008 does not require a reason for limiting or preventing the artificial decrease or increase of the number of shares through financial engineering. This article considers possible methods of preventing or limiting artificial increases in earnings per share.9 The word "artificial" in this instance is not meant in the sense of an artificially inflated turnover, but rather to denote the artificial engineering of the number of issued shares to increase the earnings-per-share ratio, without an actual increase in the company's turnover or in the net profits through normal business operations. 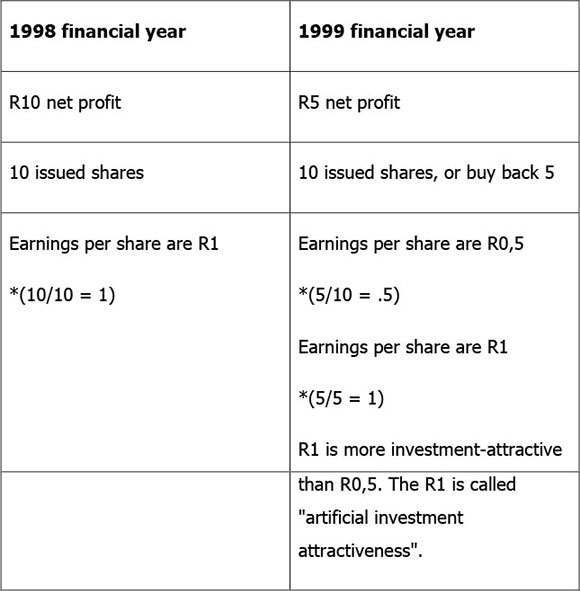 The word "artificial" should therefore be understood in the context of clever financial engineering of the number of shares issued to the shareholders of the company.10 First, however, it is important to consider the capital rule philosophy in South Africa pertaining to section 85 of the 1973 Companies Act as it was amended in Act 37 of 1999, and its significant contribution to the field of the maintenance of share capital in the 2008 Companies Act. Indeed, company law philosophy pertaining to capital rules has expanded rapidly in recent decades, partly due to the growing statutory importance of the new Companies Act 2008, and its economic significance to shareholders. Thus, as the relevant literature that covers the period from 1887 to 1999 is too voluminous to consider exhaustively, this article only briefly focuses on the significant law-orientated contributions in the two separate timeframes of 1887 and 1999. For practical purposes the "new" capital rules introduced in 1999 by the amended section 85 of the 1973 Companies Act are discussed first. The time period included in this section has implicitly introduced the relationship between the internal rate of return and the weighted average cost of capital. Even though it is not a requirement to disclose this relationship in any financial statement to determine whether the company will actually be able to comply with the twelvemonth time period, it is at least a continuous requirement up to the next financial year-end. If the internal rate of return is less than the weighted average of the cost of capital, we can assume that the company will not be able to service its debts as they become due - thereby breaching the twelve-month time period.20 If it is able to pay its debts for a period longer than twelve months, this implies true company liquidity.21 On the other hand, the requirements in section 4 or 85 can be avoided by making use of section 75 or its equivalent (section 36(2)) in the 2008 Act. Section 75 or section 36(2) requires no liquidity or solvency ratios nor a twelve-month time period as requirements to support or validate the decrease or increase in the number of issued shares. Due to the latter, the following question is posed: is the decrease or increase of issued shares an intra vires act? One such possible reason could be the prevention of a hostile takeover. Hostile takeovers have been covered in depth in law literature. The prevention of a hostile takeover relates more to the proper-purpose doctrine. For example, in the Hogg v Cramphorn case,34 the board of directors issued additional shares in an attempt to avoid a hostile takeover, since the allotment of shares was not subject to any liquidity or solvency ratios. Although the directors believed that the allotment was in the best interest of the company (the creditors of the company were not prejudiced), the court nevertheless held35 that the additional allotment of shares was for an improper purpose. Shares of a company that have been issued and subsequently re-acquired by that company, must be returned to the same status as shares of the same class that have been authorized but not issued. Shares of a company that have been issued and subsequently acquired by that company, as contemplated in section 48, must have the same status as shares that have been authorized but not issued. Similarly, section 48(3)(b) (which is equivalent to section 85) also contains the requirement of a plausible reason relating to the status of shares. A company in a relationship with a subsidiary may not purchase those shares if there would be no other shares than convertible or redeemable preference shares in the subsidiary. Section 48(5)(c) requires a genuine reason, and prohibits a buy-back if the end result of such an acquisition of shares would prevent the company from fulfilling its financial obligations - being unable to pay the creditors of the company timeously. It should be noted that section 48 does not explicitly refer to an intra vires act, but refers to the requirements of section 46 in the event of a buy-back. Section 46(1)(a) requires a legal obligation, which could imply the company's constitution. In the following paragraphs, the focus shifts to the financial position of a company as a reason not to allow for a buy-back of shares or a decrease in the number of issued shares in terms of section 36(2). Instead of altering the debt-to-equity ratio, for example by paying off the debt, the board of directors can use section 48 to alter the capital structure of the issued shares, and consequently artificially raise the issued shares' book value. Although capital or cash is required to fund the acquisition, this can easily be avoided by using section 36(2) of the 2008 Companies Act, which also alters the capital structure of shares without any cash in return for shares.47 Thus, section 36(2) is the focus of the following paragraph. (i) convert any of its shares, whether issued or not, into shares of another class. an amendment of the memorandum of incorporation by special resolution of the shareholders or the board of the company, in the manner contemplated in subsection 3 except to the extent that the memorandum of incorporation provides otherwise. The above also applies to earnings per share. Equity increases through company profitability, as was discussed earlier and was illustrated by the debt-to-equity ratio. 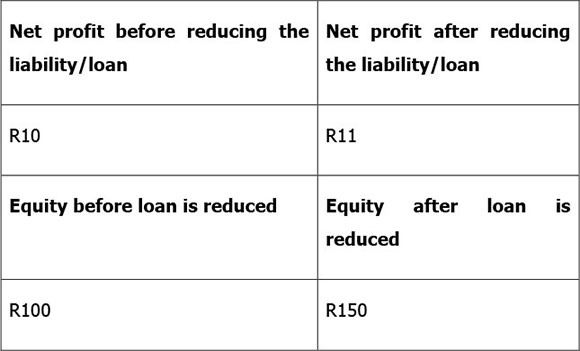 For example, if net profit is R1 000, earnings per share would be R4 per share (1 000/250). Compare this to 500 issued shares, which would work out to earnings per share of R2 per share (1 000/500). If a company is listed on the stock exchange and the listed price per share is R8, R8/R4 per share equals 2, compared to R8/R2 per share, which equals 4. In economic reality, the former simply is more investment-attractive. This artificial method of altering the status of "shares" can convert any share-capital company into a company that is attractive to investors, by means of skilful financial engineering as permitted by section 36(2). Also, the 2008 Companies Act provides for the conversion of shares into other classes of shares in terms of section 41(3). Moreover, the 2008 Act and the 2007 Bill, in sections 36(3)(a) and 34(2)(a), also make provision for increasing or decreasing the number of shares. In essence, sections 36(3)(a) or 34(2)(a) allow for an artificial increase in earnings per share without complying with section 4 of the 2008 Act, as was discussed earlier. The following represent some guidelines as to which companies should ideally be allowed to buy back shares, and which not. The same rationale should be applied to the use of section 36(2). An increase or growth in the top line (the turnover) will increase the company's additional current assets (for example cash) with which to conduct business continuously.57 It is therefore very important to understand in what way the company financed the increase (the growth) in turnover.58 If the company did so by means of increased liabilities, its profitability may be negatively influenced if the anticipated increase in the top line is not achieved, resulting in a decrease in net profit. This would constitute a poor financial position like that in paragraph 5.1 above. On the other hand, marginal or high growth achieved through current assets will lead to net profits that are linear to the increase in the top line. An increase in liabilities and a decrease in profitability will be an indication that the growth and profits are not in equilibrium and, consequently, the earnings per share will decrease. The board of directors must therefore adjust the growth rate of the company to yield favourable profitability results, as evidenced by the earnings-per-share ratio. Unless these circumstances are achieved, this type of company should also not be allowed to acquire its own shares as a method of artificially increasing the value of its shares. The following section serves to explain the concept of artificial increases in more detail, before it is illustrated with reference to a case law example. Establishing whether assets, growth and net profit are in equilibrium, or linear to each other, requires a simple financial calculation or mere common sense.59 For example, if the current assets (cash) are being used adequately to produce an increase or growth in the top line, the direct result should be an increase in net profits or equity reflected in a promising earnings-per-share ratio. On the other hand, if a company increases its liabilities to finance a buy-back of its own shares, this will affect the profitability of the company negatively.60 Under such circumstances there will be greater pressure on the current assets to increase not only the top line61 but to ensure that the additional liabilities deducted in the income statement will disclose favourable net profits. In an economic reality, the possibility arises that the current assets will not be sufficient to maintain previous profitability results owing to the additional burden of financing. In the Rosslare case,62 the assets, growth and profit of the company must be assumed not to have been in balance, owing to the fact that the company had redeemed a liability through allotting additional shares. The asset concerned was a block of flats in which a member/shareholder could occupy a flat without paying rent. The plaintiff argued that the occupation of a flat was in fact a reduction of the capital of the company. The court held that this was not so. Applying this logic to the case cited above, the occupation of a flat requires rent (growth) to be paid, and will consequently increase the top line linearly to net profits, which implies an increase in earnings per share. If rent is not paid, the asset or flat is not linear to the top line and, consequently, there is no increase in earnings per share. It is well understood that if rent is not paid, it dilutes the value of the lease agreement, and thus also the value of the shares of the company as a going concern. In the Haynes case,66 Judge De Villiers dealt with the matter of the court's discretion to grant an order for specific performance. There are certain principles affecting the court's discretion not to order specific performance if the same result could be achieved by ordering the payment of damages. A favourable economic reality may be achieved by ordering damages instead of specific performance. The Companies Act of 1973 did not make any provision for a maximum or minimum amount of capital required to float a company, or for a minimum number of shares to be issued.71 It is therefore possible for the promoters to excessively exercise their discretion when deciding on the authorised share capital, and later tailor-make (by buying back shares) or financially engineer the share capital structure in accordance with the business potential of the company, in order to generate an attractive earnings per share, especially in respect of listed companies. This has not been altered by the Companies Act of 2008. Besides the latter statutory regulation, as was discussed earlier, it is consequently proposed that trafficking in shares (such as the buy-back of shares) must be prohibited if the purpose of a buy-back is to artificially increase the company's investment attractiveness.72 In addition, the buy-back of shares could easily be avoided by making use of section 36(2), which requires no solvency/liquidity ratios or any authorisation required in the memorandum of incorporation to amend the number of issued shares.73 All that is required is a special resolution to amend the number of shares. 1 Companies Act 61 of 1973. 2 Companies Act 71 of 2008. 3 Smullen and Hand Dictionary 148. 4 Bannock, Baxter and Davis Dictionary 107. 5 Cilliers et al Corporate Law para 16.20. The rules of the JSE require shares to be issued for at least R1 per share - see Amalgamated Packaging Industries (Rhodesia) Ltd 1963 1 SA 335 (SR); Ex Parte Rietfonten Estates Ltd 1976 1 SA 175 (W); Companies Act 61 of 1973. 6 Walsh Key Management Ratios 82. The excess cash will increase the "total assets" as disclosed in the balance sheet. The return on total assets ratio will thus produce an indication of ineffective asset utilisation by the management to produce sales/turnover. A promoter is not required to have any business background or financial qualifications to float a company. 7 Benade et al Entrepreneurial Law 150. Although the company's constitution is a public document, the issue price par value is of no importance. This is clearly evident from the philosophy pertaining to no-par value shares. 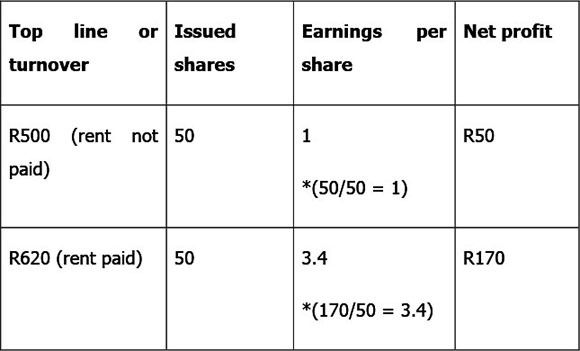 If an unlisted public company issues 20 million shares at 1c each, the earnings per share would be less than in the case of 10 million shares at 2c each. 8 See in general Ex Parte Seafoods Successors Ltd 1957 3 SA 73 (D); Ex Parte Rattham & Son (Pty) Ltd 1959 2 SA 741 (SR); Ex Parte Associated Lead Manufacturers (Pty) Ltd 1960 2 SA 36 (D). 9 Stainbank and Harrod Meditari 91. These authors suggested that earnings per share should be stated in the company's financial statements. Also see De Villiers et al SEE 95; Auret and De Villiers 2000 SEE 39. 10 Walsh Key Management Ratios 260-275; Vigario Managerial Accounting 285; Katzoff v Glaser 1948 4 SA 630 (T) 636: "...the value of anything is what it is worth at the time". In Dean v Prince 1954 1 All ER 749 (CA), the court remarked that there is no accountancy principle that fixes or limits the calculation of the value of shares. Also see Donaldson Investments v Anglo-Transvaal Collieries 1979 3 SA 713 (W) 731H-732B. 11 Companies Amendment Act 37 of 1999; Pretorius et al Company Law (6th ed) 121; Brews Take-over Regulation 28, 142. 12 Section 85(4) of the Companies Act 61 of 1973: "A company shall not make any payment in whatever form to acquire any share issued by the company if there are reasonable grounds for believing that - (a) the company is, or would after the payment be, unable to pay its debts as they become due in the ordinary course of business or (b) the consolidated assets of the company fairly valued would after the payment be less than the consolidated liabilities of the company." 13 Section 85(1)-(3) of the Companies Act 61 of 1973 required the permission of creditors to allow for a buy-back of company shares. 14 Hoice Holdings Ltd v Yabeng Investment Holding Co Ltd 2001 3 SA 1350 (W); Capitex Bank Ltd v Qorus Holdings Ltd 2003 3 SA 302 (W). 15 SAICA Financial Statements, Walsh Key Management Ratios 82. The cash-flow cycle also depends on the balance sheet information. Also see Klein v Kolosus Holdings Ltd 2003 6 SA 198 (t); Cachalia v De Klerk and Benjamin 1952 4 SA 672 (T); Extel Industrial (Pty) Ltd v Crown Mills (Pty) Ltd 1999 2 SA 719 (SCA) 732F; Iicc v Pargnnos 1985 1 SA 795 (A) 803D; Keynhans v Van der Westhuizen 1970 2 SA 742 (A); Knox D'Arcy Ltd v Jameson 1996 4 SA 348 (A). 16 See Donaldson Investments v Anglo-Transvaal Collieries 1979 3 SA (W) 731H, 732B. Shareholder value is not calculated by means of the earnings per share times the number of issued shares. 18 The 2008 Act contains similar wording. 19 Section 4(1)(b)(i) of the Companies Act 71 of 2008 also refers to 12 months. 20 Atkinson Financial Collapse 46: "Notwithstanding the apparent success of the use of ratio analysis in the prediction of company failure, it should be noted that some researchers comment that, while ratios of failed firms were found to be significantly different from those of non-failed firms, the ability of such ratios to predict failure was not so conclusive." In this regard, the internal rate of return should be calculated and compared to the weighted average cost of capital. If the internal rate of return is less, the forecast value of the company would be less than that of a company able to create a greater internal rate of return. 21 Black, Wright and Davies In Search of Shareholder Value 23: "We raise capital ... sell it at an operating profit. Then we pay the cost of the capital. Shareholders pocket the difference." The greater the liabilities, the greater the weighted average cost of capital, and consequently, the less the profits. Also see Delport Verkryging van Kapitaal 205. 22 Trevor v Whitworth 1887 12 AC 409 (HL); Pretorius et al Company Law (6th ed) 122; Benade et al Entrepreneurial Law 180. 23 Briggs 1981 De Rebus 293; Ex Parte Rietfontenn Estates Ltd 1976 1 SA 175 (W); Meskin Henochsberg (4th ed) 135. Before the Act was amended, s 83 regulated the reduction of share capital; Jooste 2007 SALJ 710; Yeats and Jooste 2009 SALJ 566. 24 Cilliers et al Corporate Law para 190.01: the shareholders are a personification of the company, and are in reality the company; see Meskin Henochsberg (4th ed) 135. 25 Also see Cohen v Segal 1970 3 SA 702 (W) 706. 26 Ex Parte NBSA Centre Ltd 1987 2 SA 783 (T) 785. In this regard, s 311 of the Companies Act 61 of 1973 can be considered illegal in terms of reducing the share capital of the company through a buy-back of its own shares, unless so agreed by the members of the company. The consequence of an ultra vires act is that the buy-back is voided; Cassim 1998 SA Merc LJ 293; Cilliers et al Corporate Law para 12.14. 27 Cassim 2005 SALJ 283. 28 Meskin Henochsberg (5th ed) 179. 29 See in general Ex Parte Witwatersrand Board of Executors Building Society & Trust Co Ltd 1926 WLD 205. 30 Black, Wright and Davies In Search of Shareholder Vauue 23; Delport Verkryging van Kapttaal 205. 31 Kilian and Du Plessis 2005 TSAR 48; Van der Linde 2009 TSAR 224. 32 Trevor v Whitworth 1887 12 AC 409 (HL); Pretorius et al Company Law (6th ed) 122; Benade et al Entrepreneurial Law 180. 33 Pretorius et al Company Law (6th ed) 122. 34 Hogg v Cramphorn 1967 Ch 254. 35 Hogg v Cramphorn 1967 Ch 254 265. Judge Buckley held that the majority of shareholders were acting oppressively towards the minority and/or that the powers of the directors interfered with the shareholders' rights as stipulated in the company's constitution. 36 Mills v Mills 1938 60 CLR 150 (High Court of Australia). 37 Mills v Mills 1938 60 CLR 150 (High Court of Australia) 162. 38 Mills v Mills 1938 60 CLR 150 (High Court of Australia) 162-163. 39 Axiam Holdings v Deloitte & Touche 2006 1 SA 237 (SCA); Correia et al Financial Management 512. The company's operations may create profit, but its future continuation depends on the availability of cash. 40 Kilian and Du Plessis 2005 TSAR 48; In Re X Ltd 1982 2 SA 471 (W) 477; Ex Parte Coca Cola (Pty) Ltd 1947 3 SA 571 (T); Ex Parte National Industrial Credit Corporation Ltd 1950 2 SA 10 (w); Berelowitz 1979 De Rebus 199, 202. A skilful broker can realise shares without affecting their current listed price. 41 Marx Investment Management 131-151. There are five different methods to calculate the value of a share, and a specific method serves a purpose in a specific circumstance, ie for a business to be valued as a going concern or not. 42 Rabinowttz v Ned-Equiti Insurance Co Ltd 1980 1 SA 403 (W). 43 Donaldson Investments v Anglo-Transvaal Collieries 1979 3 SA 713 (W) 731H-732B. The council's argument was that the net asset value or book value of shares is calculated as market cap (italisation). This is incorrect. 44 See Berelowitz 1979 De Rebus 201. 45 The market cap is calculated as the number of issued shares multiplied by the listed price per share. 46 Geyser and Liebenberg 2003 Agrekon 106. The authors recommend the shareholder value-added method as the performance measurement of an enterprise's value in the future. In Smit 2007 TGW 181, the author discusses why small- to medium-sized businesses fail in the commercial world, eg, because management does not undertake financial planning. The shareholder value-added or the economic value-added method indicates whether management is able to perform financial planning adequately, as it makes use of a forecast of current management decisions, linking these to business value. Also see Donaldson Investments v Anglo-Transvaal Collieries 1979 3 SA 713 (W) 731H-732B. 47 Companies Act 61 of 1973. 48 Cilliers et al Corporate Law 381. 49 See Weaver and Keys Mergers 14. 50 Walsh Key Management Ratios 170. 51 Marx Investment Management 139; Klein v Kalosus Holdings Ltd 2003 SA 6 SA 198 (T), where the court dealt with a reduction in share capital; Correia et al Financial Management 205. 52 Cilliers et al Korporatiewe Reg 224, 337. The authors explain redeemable shares as a "... hibriede vorm van aandele en skuldbriewe met eienskappe van beide ... alhoewel hul suiwer as aandele beskou word". Also see SAICA Earnings. 53 Walsh Key Management Ratios 182. The stock market price of a share, divided by the book value of a share, must produce the same ratio when dividing the return on equity through the earnings yield. 54 Walsh Key Management Ratios 190. Increased liabilities can create increased profit as well as increased risk. The increase in liabilities should therefore increase the value of shareholders' equity at the same time. However, if the ratio/balance between debt and equity is increased beyond a prudent level - although this may indicate an increased earnings yield or a stronger return on equity - it will serve to reduce the total company or shareholders' value in the long term. 55 Atkinson Financial Collapse 22; De Koker Roekelose of Bedrieglike Dryf van Besigheid 47; Vigario Managerial Accounting 296. 56 Donnan 1996 C& SLJ 101, which contains an interesting account of the business rules on share ratios. 57 Axiam Holdings v Deloitte & Touche 2006 1 SA 237 (SCA); AASB 2005 http://www.aasb.co.au/pronouncements/aasb_standards_2005.htm; Dempsey and Pieters Inleiding 69 - "[w]inste is inkomste minus uitgawes"; Correia et al Financial Management 512 -the company's operations may create profit, but its future continuation depends on the availability of cash. 58 Marx Investment Management 145; Walsh Key Management Ratios 122. To determine the cash-flow cycle, stock will be divided by the top line (sales), multiplied by 365 (ie expressed in days). The same approach will be used to determine days to the payment of accounts and account payments received. After calculating all the days, these must be added up and the accounts paid deducted, indicating the number of days on which there must be sufficient cash. This number of days divided by sales, multiplied by 365, as well as the predetermined growth in sales will express the amount of cash necessary to sustain the cash-flow cycle. 59 Rappaport Creating Shareholder Value 18. The cost of equity is 12%. To illustrate the 12% in practice, consider the following: The turnover of a company is R200. An increase/growth of 10% will increase the turnover to R220 (R15 investment). If the company invested R30, sales/turnover must be increased by 20% in order to create equity value. If sales increased by only 10%, although earnings per share may be higher, the value of the equity is less. This is because the amount of cash invested is neither equal to the growth rate nor at least 20%. 60 Marx Investment Management 133. 61 Pretorius et al Company Law (5th ed) 586, where the authors cite Ammonia Soda Co Ltd v Chamberlain, where the court in 1918 passed clear judgment on the importance of turnover (circulating capital) in relation to perpetual or everlasting existence. Since a company's focus is on circulating capital the intention is that the said capital be returned to the company at an increased (internal rate of return) rate - in other words, consisting of extra profits. 62 Rosslare v Registrar of Companies 1972 2 SA 524 (D). 63 Brews 1987 S Afr J Bus Manag 10; Donnan 1996 C & SLJ 101. 64 Marx Investment Management 131. 65 Pretorius et al Company Law (6th ed) 147. The auditors can also make use of tax returns to create higher apparent profits for a company. Tax returns differ from deferred tax on the basis of the delivery of money. Deferred tax is not money received by the company, because the Receiver of Revenue will debit the credit amount in the income statement. The reason behind this philosophy is that the company is a going concern. 66 Haynes v King William's Town Municipality 1951 2 SA 371 (A) 378; Wessels 1920 SALJ 265. 67 Benson v SA Mutual Life Assurance Society 1986 1 SA 776 (A). The Benson case also cited Rex v Milne and Erleigh (7) 1951 1 SA 791 (A) 873: "...[I]n contracts for the sale of shares which are daily dealt in on the market and can be obtained without difficulty, specific performance will not ordinarily be granted." 68 Kerr Law of Sale 598; Kerr Principles of Contract 677. 69 Pollard 1995 C & SLJ 353. 70 Kerr Law of Sale 599; Ribstein 1992 Nw U L Rev 284. 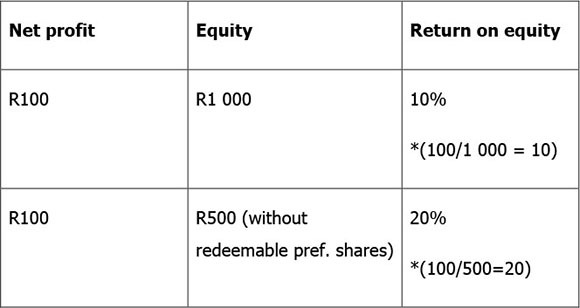 71 The rules of the JSE require shares to be issued for at least R1 per share. 72 Berelowitz 1979 De Rebus 199, 202; Brews 1987 S Afr J Bus Manag 10. 73 S 75 of the Companies Act 61 of 1973 required authorisation to amend the number of issued shares in the articles of association as well as a special resolution.